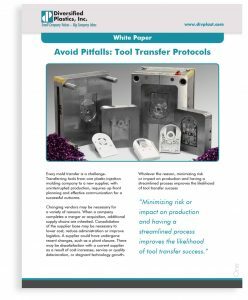 Avoid Pitfalls: Tool Transfer Protocols White Paper Diversified Plastics, Inc.
Every mold transfer is a challenge. Transferring tools from one plastic injection molding company to a new supplier, with uninterrupted production, requires up-front planning and effective communication for a successful outcome. This white paper provides steps to take when transferring tools.